Cala Millor is the liveliest and largest holiday resort on Mallorca's rugged northeast coast. The name means 'better bay', which is indicative of its main attraction: a mile or more long stretch of sandy beach, which slopes gently into a crystal clear blue sea, protected at each end by rocky headlands. Sunbeds, parasols and pedalos can be hired for the day by sun seekers. The rest of the island's east coast is lined with inlets and coves, which are fun to explore. Cala Millor developed as a favourite destination with holidaymakers from one hotel, the Eureka, built in the 1930s, and is now a bustling enclave of high-rise hotels and apartment blocks, slowly merging into neighbouring resorts along the coast, fronted by a wide pedestrian promenade along its alluring beach. Adjacent to Millor, across the headland to the north, is the quieter and more traditional resort of Cala Bona, with a little harbour, while a few miles to the south is the well-known resort of Sa Coma. Cala Millor is about 40 miles (70km) from the Son Sant Joan International airport near Palma, the capital, in the south of the island. The area, particularly favoured by German holidaymakers, is packed with shops, markets, entertainment venues, bars and restaurants to ensure non-stop fun in the sun. The resort is particularly well-suited for family holidays. Holidaymakers will find that the pedestrian promenade that runs along the Cala Millor seafront is jam-packed with stores and stalls selling a multitude of souvenirs and tourist requisites, open until late in the evenings. Visitors will also find, however, that the selection is repeated over and over again in the different stores and variety is limited despite the amount of shops. A fun option for shopping enthusiasts is to head for Mallorca's markets where bargains like lace tablecloths or leather goods can be picked up, after a bit of haggling. 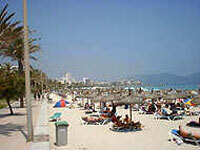 The closest markets to Cala Millor are Son Servera, held on Friday mornings, and Monacor on Mondays. Special buses are usually available for holidaymakers to reach the bigger markets, particularly those at Palma and Inca. There is a wide choice of restaurants scattered along the seafront promenade of Cala Millor, and around the fishing harbour at adjacent Cala Bona. Most are eclectic, serving a variety of dishes to cater for the tastes of hungry holidaymakers with others dedicated to international cuisine. Oxford Blue, Cafeteria Restaurante Bella Vista, Alahambra and Antonio Montoro are among Cala Millor's top-rated eateries for holidaymakers. Fast-fooders will find Burger King and KFC at hand. Nightlife in Cala Millor is essentially low-key compared to some of Spain's well-known, rowdy holiday hotspots. A great deal of the evening entertainment is hotel-based, but those who like to be out and about will find plenty of fun at the numerous British bars, like Cheers, which offer a variety of pursuits from karaoke to quiz evenings or bingo. The younger set is catered for by a few discos, the largest being Palace Q, which play a mix of Spanish and international music. The club scene, however, is not as boisterous as that to which the 18 to 30 crowd may be accustomed. Cala Millor is designed primarily for a relaxing beach holiday, its seafront strewn with sunbeds and pleasant pavement cafes where one can sit back and watch the world go by. The beach is well supplied with all the popular water sports offered by local operators, and glass-bottom boat trips. The more energetic can enjoy strolling the promenade to the headlands and beyond, seeking out the creeks and coves of the lovely coastline. A little further afield there is a golf course, a waterpark and several other attractions including a safari park and the Drach underground caves, all accessible by bus. Visitors looking for a good party and clubbing-scene should look to other resorts as the nightlife is fairly limited in Cala Millor.